You don't see foie gras sold or served commercially in California anymore. Luckily, oysters are not banned in the State of California, so I can buy as many oysters as I want right now. I wonder maybe in the future oysters will also be banned because some people say forcing open the oyster shells is considered animal abuse?! "Milk" of the ocean. I love oysters so much. This is what I make sometimes as one of small dishes to serve at dinner. 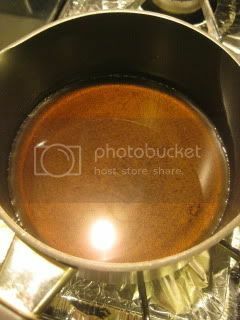 I do quick high-heat simmer of oysters in Chinese rice wine in donabe skillet, "Toban", so the flavors are sealed inside and oysters come so plump and tasty with the effect of toban cooking. 1. To clean the oysters, in a bowl combine the oysters and 1/2T salt and mix by hand throughly. Rinse in running water and pat dry the oysters. 2. 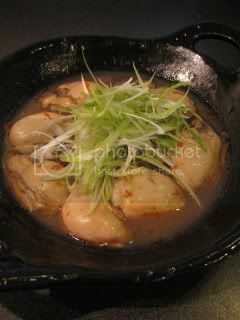 In the donabe skillet, "Toban", add the oysters and sake and bring over high heat. Once the oysters are plump, add the oyster sauce and soy sauce and stir once. Turn off the heat. 3. Drizzle some la-yu and garnish with thinly-sliced scallion. I also made a couple other izakaya-style dishes to go with donabe rice. 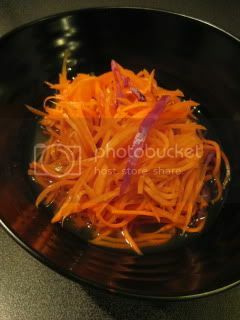 Carrot in ama-zu (sweet and sour) marinade. 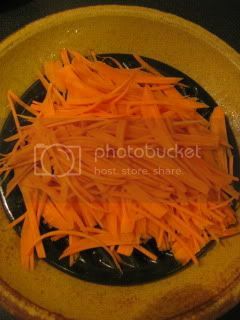 Carrot slices were steam-roasted until crisp tender in the microwavable-donabe, "Tochinsai". 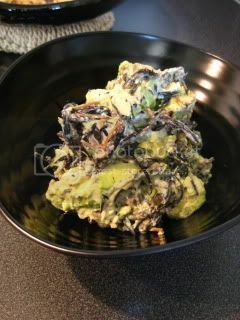 I also made hijiki and avocado salad.